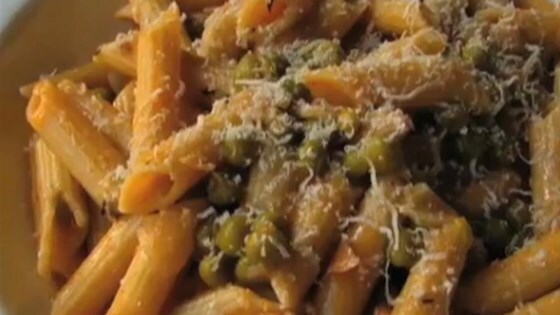 "Inspired by depression-era pasta and peas, I decided to do my own take on this meager macaroni. I hope I'm wrong, but I think the next big thing in the food world is going to be these types of 'frugal fabulous' recipes." Heat oil in a large saucepan over medium-high heat. Saute onion and prosciutto in hot oil until onion is soft, 5 to 6 minutes. Stir garlic, salt, red pepper flakes, and black pepper into onion mixture; saute until fragrant, about 1 minute. Pour chicken broth, tomato sauce, and thyme into onion mixture. Add peas and beans; bring to a boil. Stir penne into broth mixture and cook for 7 minutes; remove from heat. Stir Parmesan cheese into penne mixture, cover the saucepan with a lid, and let sit until the pasta absorbs most of the liquid, about 5 minutes. Sorry, we did not like it very much. Made without the beans and followed the rest. Husband and I loved it. Made it exact to recipe! Thanks for sharing! We loved it and I will definitely make it again. I ended up cooking it a bit longer and I put in a bit more garlic, but we love garlic and I usually add more than recipes specify.